I'm Andy Breeze and Breeze Electrical Solutions is the trading name for my electrician business covering the Forest of Dean and Wye Valley. Formerly known as AB Electrical Solutions, I changed my trading name on 31st October 2012 to avoid confusion with a similarly named local electrical contractor. 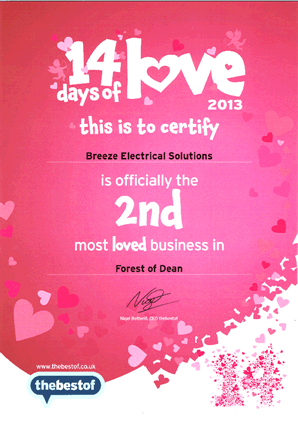 I qualified as an Electrician in 1991 in Kent & moved to the Forest of Dean in 1995. I updated my City & Guilds qualification from the 15th edition of the IEE regulations to the 16th, then to the latest 17th edition in 2009. I started as a self employed electrician in 2009 and carry out all kinds of electrical work from a single socket or a light to a new consumer unit and extensions. My experience is varied from domestic to commercial and industrial (including 3 phase). I hold a current enhanced CRB check - so meet the legal requirements for public and commercial premises where CRB paperwork is required.